I’ve written before about how to prepare for gadget use at conferences like The Amazing Meeting and Dragon*Con Skeptrack. In a few days I will update my guide to WiFi at Dragon*Con for 2013. But in preparation for that event next week, let’s go over some typical items a live blogger or live Tweeter might want to bring with them to a conference. It used to be that a laptop computer was all but required if you were going to live-tweet or live-blog from a conference. But these days you can get almost everything you need done via a smartphone or tablet. I’ve used both Android and iOS over the years, there are different advantages to each. My current gear is an iPhone 5 and an iPad Mini . The iPhone truly works anywhere and on the go, but the iPad is better when you are in one place for a while. I like the small tablet form factor because it’s easy to hold in one hand, but it’s still big enough that you can get larger things done like edit blog posts and so on. The big advantage of tablets over laptops is they (generally) have far better battery life, which can be crucial in some conference situations – more on that below. But the key to using a tablet (or any device) is to ensure you have an appropriate wireless connection available during the event. If your chosen device has 3G/4G built in, double check to make sure your provider has coverage at the convention site. If no mobile Internet is available, you will need to rely on the local WiFi. This will vary from event to event – some hotels have pervasive free WiFi, others charge, and some events provide their own. Just be sure to do your homework, which may involve calling the hotel or checking with other attendees. And listen carefully – many facilities have radically different WiFi arrangements in the hotel rooms versus the meeting rooms. Don’t just ask, “Do you have WiFi?” and leave it at that. I actually failed to do my homework before TAM2013 this year. I had forgotten that when I upgraded my phone between TAM2012 and TAM2013, a side effect was that I switched which 4G technology my phone supported (from WiMax to the newer LTE). That’s easy to ignore in my home town, where both are supported by my provider. But it turns out that while Las Vegas has excellent WiMax coverage, my provider does not yet offer LTE coverage there! I had neglected to check. And I discovered this just days before my trip – due to a fortuitously timed comment from Blake Smith of MonsterTalk. I could try to rely on 3G service, but I knew that would be painful as I would be uploading many photos from the event. And so at the last minute I needed a way to provide on-the-go Internet for my WiFi-only iPad (and other devices) in the South Point convention center – which has no inexpensive WiFi of its own (outside the hotel rooms). I didn’t really want to sign up for another contract that I would only be using for a few days. Fortunately there are some rental and pay-as-you go options that exist now. I covered many of these in my digital guide to TAM2012. While the prices in that post might be out of date now, most of those options still exist. A new one that has popped up since that time is Karma Wireless. You buy a battery-powered pocket hotspot that essentially translates a 4G connection to WiFi. You pay for the bandwidth you use by the Gigabyte, with no service fee. An interesting wrinkle to Karma is that if other Karma customers are nearby, you can share their access point or they can share yours. Clever. What I decided to get was a Virgin Mobile Broadband2Go hotspot (pictured above), which also allows you to pay as you go, but on a time basis. (They claim unlimited megabytes on 4G, but do read the small print – it’s not quite unlimited. However, I’m a pretty heavy user and I never hit the limit at TAM). So you can actually just activate it for the days you are at the conference and let it lapse after. And it uses the 4G WiMax provided by Sprint, which I knew was available in Las Vegas. With either Karma or Virgin, there’s an up-front cost to pay for your hardware, but after that you just pay for the time or gigabytes that you use. If you don’t use the device for a while, there are no ongoing fees. Click the Virgin device you see above if you’d like to buy one. A huge thing that many people forget when they come to a conference is how fast their batteries are going to run down. It’s amazing when you are live tweeting, or shooting photos all day, how your device that normally lasts all day will suddenly be dead before lunch. This is another case where researching the venue helps. Some facilities have plenty of readily accessible outlets near where you sit, so you can plug in and just charge all day. It may just be a matter of getting to the room early and snagging a seat near the wall or in the back. But other venues can be more difficult – for instance a large hotel ballroom that seats 1,000 people is unlikely to have outlets for everyone. The hotel where The Amazing Meeting is held is particularly bad in this respect. If your device(s) have removable batteries, you can buy extras and keep them charged. But some devices don’t allow this, so external battery packs have come on the market. They typically let you charge any device that can charge from a USB connector, including smartphones, tablets, cameras and Internet access points. Some will even let you charge more than one device at a time. Several of these batteries are pictured in this section. I used the one at top left, which is made by Mophie and is sold in Apple stores so I knew it would be compatible with my iPad. It has two USB outputs so it can charge both an iPad and one other device at the same time. The other ones you see were all used and recommended to me by other TAM2013 attendees such as Travis Roy, Greg Dorais and Brian Hart. Some are smaller to more easily fit in a pocket, others are larger and can charge your phone multiple times. Again you can click any of the photos to purchase that model at Amazon, and there are yet other models available at that site. Don’t forget to bring all your necessary charging and connecting cables! I like to bring at least one extra of each key type, if I have them handy, so that I can leave charger ready to go in my hotel room while still carrying one with me for charges on the go. Not only does this give you some insurance in case you leave a charger behind, but you’ll be ready to rescue a fellow traveler who may be in a bind. 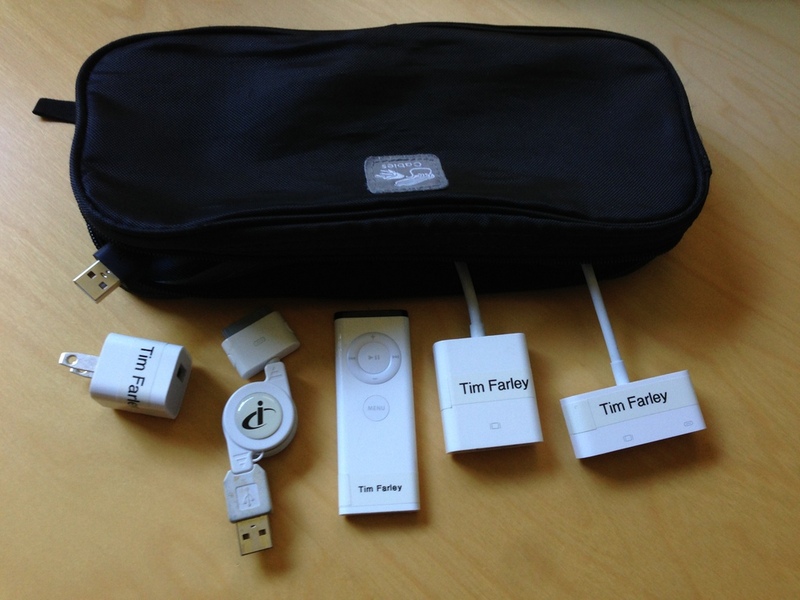 If you use Apple devices and give presentations, you usually end up with one or more adapters for that purpose as well. These devices are often surprisingly expensive, so I put labels on all of mine (including my mobile phone number, obscured in the above photo) so they don’t get misplaced when at a conference. It’s great to rescue another presenter who forgot theirs, but you do want your devices to find their way back to you afterward. If you do have a number of USB charger cables in your kit, a very helpful item to add is a USB extension cord . This will help you in situations where the typically under-one-meter cord that comes with your device just won’t quite reach to the nearest outlet. As you can see I also have a small bag that I stash all these cables and adapters in so they don’t end up scattered all over the inside my larger shoulder bag. 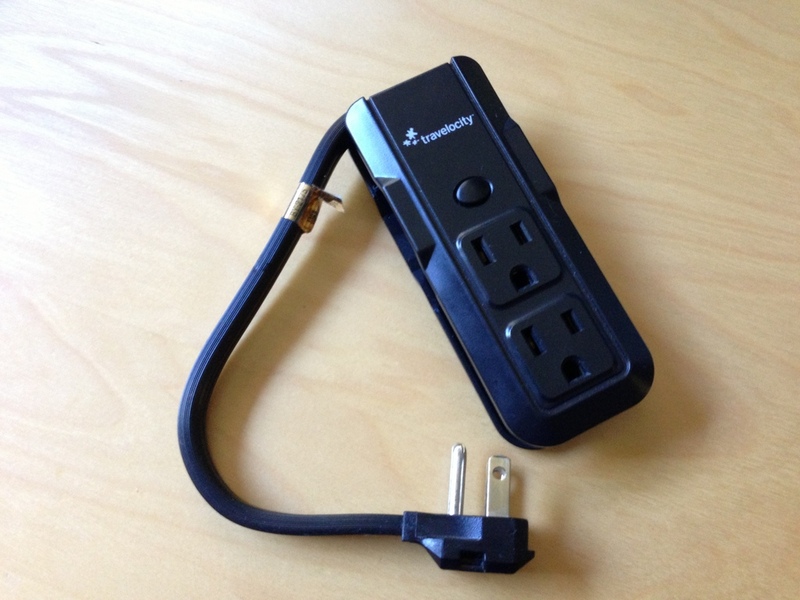 At first glance this seems like the world’s worst extension cord, because the cord part is only inches long. But it’s only intended to turn one outlet into three, which can be crucial in hotel rooms or conference halls that have limited outlets. This travel strip (and ones like it) are designed to pack up tightly so they don’t take up much space in your kit. Pictured here also is another one I recently discovered which combines a compact form with two A/C plugs as well as two USB plugs. This will let you charge two devices as a nearby plug while still offering space to others. Again you can click the picture at right or click here to purchase the one I have at Amazon.com. Finally, don’t forget to take care of your devices at the event, keeping each one (including the extra batteries) charged each night – as pictured in the tweet at the very top of this post. Disclosure: All the Amazon links in this post are affiliate links that benefit my work here and at What’s the Harm.